I’m going to be offline for the next two days while we celebrate Rosh Hashana. Thus the short post today and lack-of-a-post tomorrow. For those who don’t know, this is the Jewish New Year. One of the many traditions on this holiday is to eat apples and honey. This is supposed to help you have a sweet year. I’ve got plenty of both here. If you celebrate Rosh Hashana, I hope you have a good year ("L’shanah tovah"). If you don’t, I hope the rest of your year (and all of the ones after this one) are very sweet. What is a favorite holiday tradition you have? 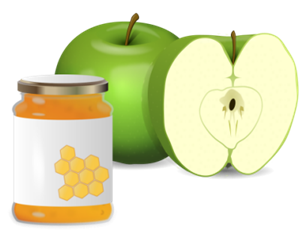 Disclaimer: The image above was created by combining Apples by gnokii and Honey Jar by PrinterKiller. Both of these images are available on OpenClipArt.org.